Instant air cushion sparger systems are an essential feature for any facility. Natare sparger systems (bubblers) utilize special stainless steel and PVC sparger nozzles (diffusers) and are installed in the pool floor, directly under the diving boards or platforms. The system provides a mound of bubbles to cushion the diver’s impact into the water and gives the diver a clear visual reference for the water surface. An air safety cushion sparger system is a combination of air compressor, sparger diffuser nozzles, control valves, filters and controls individually selected to provide the correct quantity and quality of air to the bottom of the diving pool. Bubbles are activated on demand by the coach or trainer using a handheld remote control that starts and stops the release of air. The bubbling action normally lasts for between 5 to 7 seconds, providing adequate time to coordinate the air release with the diver’s entry into the water. The sparger nozzles are supplied by a high capacity compressor and storage tank, which are located in a remote mechanical room or service area. Air safety cushion systems can be installed for permanent or temporary use, either during new construction or for existing pools. 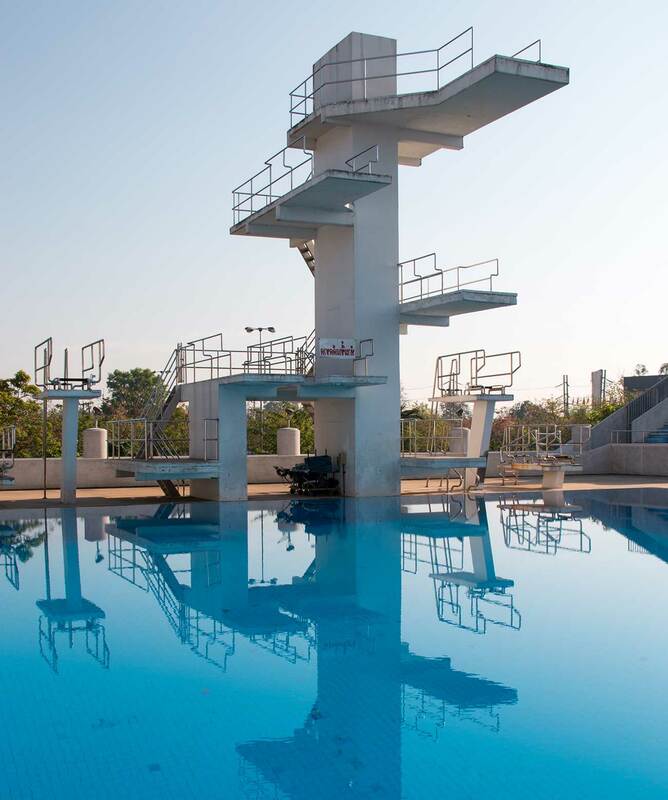 The coach or trainer communicates with the diver to coordinate the initiation of the bubbling action as the diver leaves the tower or platform, then stops the air flow after the diver enters the water. Operation is simple and easy, and both coach and diver soon learn to maximize the beneficial effects of the system. Air cushion sparger systems are designed and manufactured specifically for each application. The number, size and location of the aerating sparger diffuser nozzles are custom designed for diving pool depths, board heights and locations. Compressor, air storage and compressed air needs are based upon diffuser nozzle requirements and required cycle times. Typical systems consist of a base mounted compressor with one or more air receivers (air storage units). Depending upon compressor size and storage capacity, dives can be completed as often as every 2 to 4 minutes. In addition to the air compressor and storage units, a complete air quality and control system is provided. The systems include pressure reducing valves, filters, air regulation valves, electric solenoid control valves and control panel. Remote handheld push button control pendants can be radio controlled or cable connected to the control panel. One high capacity rotary screw compressor system adequately rated to provide the required air flow for the air sparger nozzles. One or more vertical or horizontal air receiver suitable for 200 psig working pressure with a total volume as required by the system design. Manifold components, valve motorized control valve, control cabinet etc. Required outlet branches for each sparger nozzle delivery pipe with non-return check valves for each line. Regulating valves for each outlet branch for water surface agitation discharge rates and actuated valves for cushion air release. Download more information to aid in the planning, design and purchasing of your sparger system. Learn more about our unique systems and how we can customize for your pool.